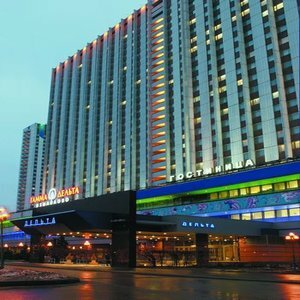 The "Izmailovo Gamma-Delta" hotel complex can accommodate in its two buildings over 3.5 thousand guests. The hotel is located in a picturesque district of Moscow, not far from Izmailovsky Park, at the place of an ancient village of Izmailovo. It takes just a 5 minutes' walk to get to the Izmailovo Vernissage art fair and the Russkoye Podvorye crafts centre, where works of modern artists and folk crafts are presented. The crafts centre is designed as a single architectural ensemble styled to Russian wooden architecture of Peter the Great's time. Moscow downtown is accessible by taxi from the hotel. Those who travel by car may use a guarded parking. Partizanskaya metro station is within 3 minutes' walk from the hotel. Sheremetyevo International Airport is situated within 50 minutes' drive. The hotel offers accommodation in Single, Double rooms, and Suites. Each room has a bed, a desk, a coffee table, a chair, a refrigerator, a TV-set, a telephone, and a bathroom. Suites offer soft furniture, a potable water system, a dining table, a buffet with a tea set, and a bathtub. The hotel offers a selection of 15 dining opportunities: the Mikhail Svetlov restaurant, Vechernee bistro, the Moskovsky restaurant, the Golden Fork, the Amaterasu Japanese restaurant, the Viennese cafe, the Black Panther and the Amazonia cafe-bars, the El Shark Oriental confectionery, and two lobby bars. The "Izmailovo Gamma" Hotel is well-equipped for hosting business and social gatherings. The meeting areas provide 16 conference rooms with up to 500 pax capacity, high-speed and Wi-Fi Internet access. The first floor of the Gamma building is occupied by the wellness centre with Russian and Turkish baths, saunas in various styles, a swimming pool with a counter-flow, a geyser and underwater massage, recreation rooms, a massage room, and a bar. The fitness centre offers a well-equipped gym, a group exercise hall, a massage room, and a fitness bar. The hotel also features a billiards club, an Internet cafe, and a game zone. The service offices located in lobbies of both buildings of the hotel provide informational service, taxi call, faxing and copying services, telephone cards sale. The hotel also features the following facilities: currency exchange offices, ATMs, a pharmacy, souvenir boutiques, shops, a beauty parlor, a medical point, a notary office, safe deposit boxes, air and railway tickets booking offices, a luggage room. Guests of the hotel may also use laundry, dry-cleaning, clothes and shoe repair services.